I just watched on CBS news a story which again brings tears to my eyes. Such loyality from one dog is the reason for me being SAPPY again. Her name is Ella. 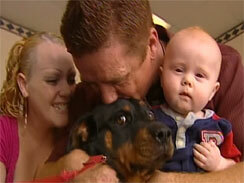 A Rottweiler dog.. who was riding in a car which flipped over and Ella was thrown out of the car. they did not know the dog was alive or the whereabouts of Ella. Ella was emaciated and drinking from a drainage ditch along an empty stretch of highway. Kathy says it's typical for people to dump unwanted pets in the middle of nowhere – but again, the dog's demeanor convinced her there was more to the story. So she did some detective work, and what she found is a heart-wrenching tale of unending loyalty. Ella stayed in the location of the accident for 13 days before being rescued by Kathy who runs a rescue for dogs..
After doing an investigation on her own she located the family of the Ella and reunited them only to find out they have to move due to financial problems since the accident and the new place won't allow pets so Kathy the rescue owner will hold Ella until the owners can take her back. Finally a happy ending to a sad story.. This entry was tagged dogs., Ella, news, pets, rescues. Bookmark the permalink. Hi Sarah,I am sorry you had to give her up.. it's heart wrenching whenyou get attached to a pet and then have to give them up. this story made me cry to know this dog stayed around the location of the accident for 13 days thinking the humans would come back ..Thank God for people like Kathy who did investion to find the owers. we need more people in the world like that ! Id like to teach the world to sing,in perfect harmony ,Id like to buy the world a coke and keep it company….. haha just reminded me of that ol coke commercial were everyone holds hands and sings and theres so much love ! theres another one I saw about a dog who cant decide where to bury his bone….he tosses and turns and dreams of his bone ,its really cute ! Animals are such cute actors ! ya thats the one ! sooo cute !